I’ll never understand the lure to some of the full-motion video genre. I’ll admit that there’s a select few that rose above their mediocre confines and shined, but nine out of ten of them were almost unplayable at best. Game developers of the day, notably Digital Pictures, really thought this was the wave of the future and started cranking them out in record force. Look where it ended them, all in a hurting state. 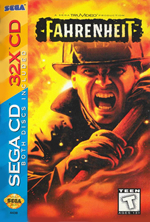 Sega was responsible for this little-known game called Fahrenheit, surprisingly enough, and depending on how you look at it, it can be a blessing or a curse. 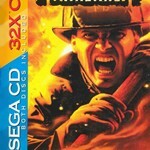 On a standard Sega CD this game is acceptable enough as far as FMV games go, but on the 32X it’s a new beast entirely. Both the Sega CD and the 32X CD versions came packaged in one case, and the Sega CD version is easy enough to play on its own. On the 32X CD, however, you need three units hooked up and three separate power supplies, and then you need to insert the first disc. This then tells you to put in the second disc, which is the 32X version, each and every time you play this game. Not too much fun in that if you ask me, and it’s even worse for me since I use a X’Eye and have to try to get the disc out without removing the 32X and accidentally resetting it. Either way you look at it, this game is not worth your time to make and energy with the setup requirements. What was Sega thinking? The game starts off with a nice hammy intro with a terrible theme song that probably sounded dated even back then. It then goes into a brief intro which introduces you to the captain and your three fellow fire fighters. Once that gets down it’s off to complete the game’s three scenarios. The premise of the gameplay (what little of it there is) is pretty simple. Each scenario has you entering a burning house or building, and any time you reach a door or a hallway a set of arrows pop up on the screen. Depending on which direction you press you will go to that area of the building. The object of each area is to find the trapped person and get out. Your air tank acts as your health meter, and it drains slowly. Throughout each area there are hazards that you can diffuse, such as removing kerosene heaters and shutting off gas lines. If you do then it refills your oxygen and gives you more time to find your victim. Once you make it out you’re congratulated and praised and then sent off to the next scenario. The game gets pretty confusing and tedious in the later areas because there’s only so much video on the disc and many of the rooms look the same. Sometimes the arrows pop up pretty quickly and make it hard to access the right rooms. I actually got pretty bored seeing the same rooms over and over again before finding the correct path. The video quality is pretty nicely done on the 32X upgrade, but it still gets pretty blurry in the faster moving areas. For an FMV game it makes decent, albeit simple use of the limitations of the genre and is definitely one of the better FMV games. This version also kicks the video quality up quite a bit but lets the audio quality tank completely. It seems like they never got around to fixing the audio compression issues this time around, and everything becomes hard to hear. The character’s voices all become staticy and scratchy and hard to hear, there seems to constantly be a low buzzing sound through the entire game, and the rest of the audio seems to just bleed together. Anyone of you who remember what a heavily worn VHS tape starts to sound like will understand exactly what this game’s audio sounds like, and it’s not pretty. Fahrenheit as a whole isn’t a complete waste, but it’s just not worth the effort on the 32X. You can check out the review of the Sega CD version here, and that’s the version to stick with. Though I didn’t hate it, I didn’t have that much fun with it overall, and to top that off the 32X CD version is just way too much effort and trouble to get running. For those reasons it gets a great bit pass for me! HAHA my dad plays Hobbs in this game. Ha, that’s great! My other half and I were just playing this game yesterday, too. Give your dad our regards from Sega-16; while the game he’s in may not be the best game in the Sega CD library, it’s certainly one of the more playable FMV games (once you get used to the confusing control scheme), despite the huge emphasis on trial and error.